This is the facade of our hotel, another of the noble houses in the town. 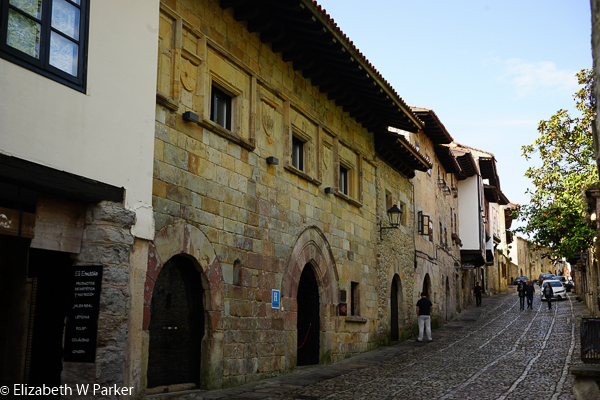 After breakfast in the hotel, we headed out with our cameras to walk the still sleepy (though it is 9:30 am) streets of Santillana del Mar. Any guide book will tell you that Santillana del Mar is not on the water, so being the accurate blogger I am, I will tell you that, too! I believe that the name comes from Saint Juliana del Mar (Santillana is a contraction of her name) and the “del Mar” just indicated which Saint Juliana is in question. There is a ceremonial tomb for her in the city church. She actually lived and died in the Middle East. Purported to be a lovely town by the guide books, we would agree! Old houses of the 13th, 14th, 15th, and 16th centuries line cobblestone streets. These are the houses of nobles for sure, but a city made up of residences has a different feel than a city of public buildings, even if they are all of the same age. The public well, the church facade is in the background. There are just two main streets in town, so you can walk up one and down the other. Our hotel was near the church end so we headed in that direction first. The church was part of a monastery in the village and was the church where the nobles hung out. 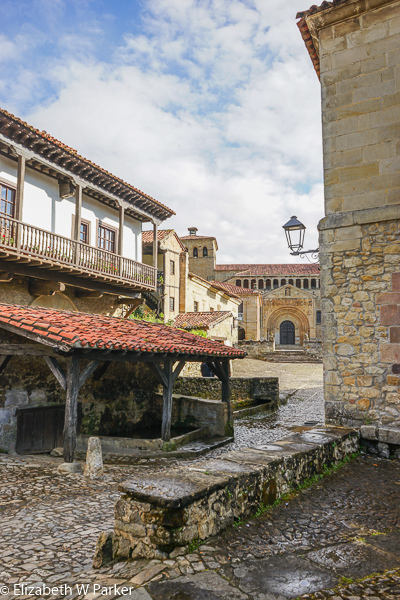 Called a collegiate church, it was neither a parish church nor a cathedral, Santillana being too small for a bishopric. To see the collegiate church and its cloister you need to walk around the left side of the church(as you are facing the front) to find an inconspicuous door (especially when closed as it was on our first circumambulation). We entered through the cloister which was filled with sunlight and lots of lovely columns whose capitals are worth a close look and study. There are also lots of sarcophagi lining the walls. These were excavated from the central garden are of the cloister. Most are not identified but are thought to be from the inhabitants of the monastery. The church is dim inside but interesting. Dating from the 12 and 13th centuries, it has some strong Romanesque features, despite the later muddling of styles. Walking the street of town, you’ll see the well and the houses of noble families. A good guidebook (ours was Michelin Green) will tell you about the heraldic sculptures on the facades and the lineages that they reveal. On a Saturday morning, there were many people coming into town, both tourists from many countries including Spain, and shopkeepers and restaurant owners bustling in preparations for what would surely be a busy day. We were glad that we spent the night here. We really liked our hotel. It was good to have a nice calm dinner just a short walk away. It was especially good to be able to go out early and see something (not to have to wait for things to open) and proximity to the Altamira Caves made it a double header! Once we had walked the town, we did go back to check out of our hotel. We picked up our little Snowball and drove the mile or so out of town to the site of the Altamira caves. Guided tours are available, but the signage along the way is abundant and clear and in all of the major European languages, so if you’re one who likes to linger as you look, you might opt for self-guided as we did. Yes, it took us a little longer to find some of the images, but the discovery was half the fun, as was discovering many other curious images in the search. Accompanying the cave visit is lots of information about what we think we know so far about the pre-historic people in this area. The paintings in the cave date from between 25,000 and 13, 000 BCE. Altamira was inhabited during the Ice Age. It seemed ironic to me that the people abandoned the cave as the world got warmer! Yet as the ice receded, and Europe took on the basic shape it has today, the people of the cave (and they were homo sapiens) were able to branch out and roam farther away, their need for a permanent and long term shelter not as pressing. The cave is dated thanks to science (that currently maligned disciplined)! Various layers in the excavation of the cave revealed details about the diet of these Paleolithic people, which also chronicled the warming of the oceans as fish did not appear until the latest layers. Tools were also found, including those made of flint and bone. The reproduction tour starts in the mouth of the cave, a long horizontal slit that allowed sunlight to enter. It was in this section that most of the daily accoutrements were found as this was the area the greatest number of people would have inhabited. As you go back into the cave, where the paintings are, it is darker and the ceiling would have been quite low. (In the reproduction they have provided a lowered floor so that you can stand and look up at the ceiling. The man-made lowered floor was one of the features of the original caves that led to their serious deterioration and eventual closing – just too many visitors were able to come to see them. The reproduction is exactly to the actual scale of the original, right down to the bumps, cracks and bulges in the ceiling. The art is amazing. It is extraordinary to think that these images were made over the course of more than 10,000 years! Just comparing them to the churches we are seeing, the amount of art that can be destroyed and covered up in just 200 or 300 years, makes the existence of these caves pretty amazing. Yes, there are areas where there is painting over an earlier image, but the cave is not that big. That the whole thing was not painted over ever century or so seems prophetic, doesn’t it? You will see the museum after you visit the reproduction of the cave. The museum gives more details about the discovery of the Altamira cave, and the subsequent race to discover more caves – and there are more! There is a whole string of them along the north coast of Spain. On a future trip, I will probably drag my traveling companions to see them all! The museum also goes into details about the climate conditions during history (It is very interesting to see how temperate time periods (like the one we are in) were short little anomalies on the peaks to hot eras and the troughs to the coldest. From Santillana del Mar and Altamira we once again followed the coast, now en route to Oviedo. Today, the road is less sinuous, the traffic sparse and the views easy enough from the car. We paused for a short car detour and a few pictures in Comillas, but it was too early for lunch and we did not see the Gaudi building that is supposedly here so we continued. We stopped on a hill past San Vicente de la Barquera from where we could get an amazing view of the ria, the significant feature of this town. A ria (no, not a misspelling of rio) is a place where the sea water has made an inroad into the coast, like a fiord. The result here in San Vicente de la Barquera is an extremely wide tidal plain, which at low tide, had left boats high and dry on the sand. The water remaining in the deepest parts, could still hold a boat afloat and it was here that we could see larger fishing boats moored. From the distance on the hill it was possible to imagine the entire area under water at high tide. We had lunch in our first sidreria. A sidreria is a place that serves (hard) apple cider. It is like a birreria (Italian) or ceveceria (Spanish), just a name for a restaurant that focuses on cider (our case), or beer (the other two). Though all of these places serve other beverages too, the distinction is more one of emphasis and marketing. We have seen many sidrerias here in Asturias, whereas we saw none earlier in the trip. Our sidrería was a modern one, and our server more than happy to pour our cider for us each time he passed the table. The pouring is a sort of ritual of cider drinking. Pouring it from high above the glass introduces air and produces a froth, said to activate the apple flavor. It is poured in little quantities so that you get to enjoy the froth and the apple flavor with each gulp. You are supposed to gulp down the cider while the froth is still frothing. The cider is not sweet, like American apple cider, and it makes a great accompaniment to Asturian food, which so far, for us, has been on the heavier side – meats and fried. We walked off our lunch at Llanes, then headed for Oviedo. Thinking we were settled in the car for the trip to Oviedo, we had to make a sudden stop just as we were leaving the town of Llanes, for here was a beach, with the strangest rocks! Called the Playa del Toro, the Beach of the Bull, the waves were crashing against these odd rocks that stood sort of straight up in the water, and made a chain across the mouth of the beach. Actually we have seen some interesting and different rock formations on the beaches of this northern coast, but most have been sedimentary rocks, metamorphosed and now standing upright, eroded into long lines. This was different as the rocks were rounded and tall. After taking pictures here, we just had one more stop before we could sleep – the Mirador del Fito. The mirador, or overlook, was about 5 KM from the main road and, naturally, at the end of an extremely twisty road. But every centimeter was worth the view! Mountains, oceans, farms were all below us in splendid detail. Worth a trip!